This is just a small little note card, 2.5 by 2.5, I think. It is a sympathy card for a co-worker of my husbands who lost her cat. I know it is almost a repeat of the card my made for Caesar but it works. The picture does not do it justice though, it turned out great. Apparently it matches her office. 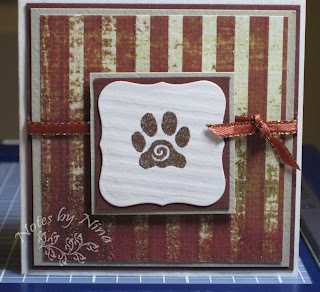 Supplies: Cream, burgundy and tan cardstoc, Designer Paper-My Mind's Eye, Pink Cat Studios- cat paw, Celebrate It - Holiday ribbon. 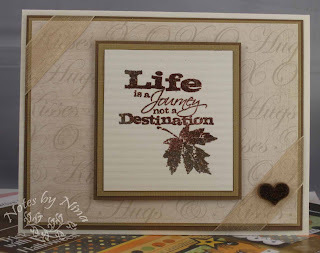 I attended a Stampin' Up! gathering last weekend and we made Christmas cards. I think this idea is so cool. 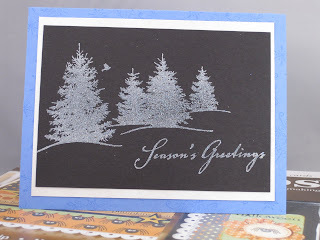 We used two tag punches to make the thin outlines of paper then glued and cut to make this pointsetta. 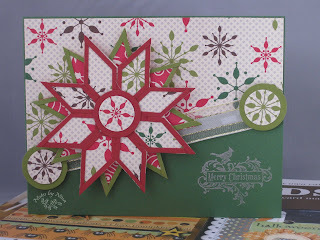 I screwed up so I had to add the two little snowflake parts on the end of the ribbon but I still like this card. 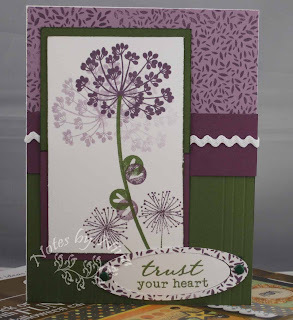 Supplies: All Supplies Stampin' Up! except for maybe the misc ribbon. I was going through the folders on my computer to clean up my temp directory for my posts and realized I had not posted this card that I made sometime this summer. I don't have any sports related stamps so I borrowed from Microsoft Office clipart. While I was at it I also found a font to match (Happy Birthday) and printed them at the same time. More Halloween, this image does not show that I used my Spica glitter markers to color the Plaque it is very glittery and makes a difference for the card, I find coloring is always fun. 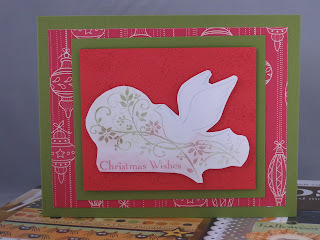 I still have a couple more to show and will mix them in with other cards as the week progresses. Some are similar with just some color changes. Supplies: Cream, green, orange and black cardstock, Designer paper- Recollections Halloween, Stampendous-Pumpkin Plaque, Recollections-Pearl Stickers, misc Halloween ribbon. I though I had already posted this card, I have a half a dozen waiting in the wings to be posted. I save them though in case I don't get too many cards made. How bad is that. I have not even had the chance to blog hop and share comments for about 2 months... Way too long. Anyhooo this card was made for my brother and his wife for their anniversary. Simple and I was happy with it. 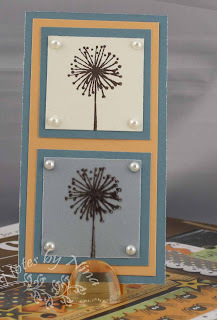 I love the Dazzles from Hot off the Press available at PaperWishes. 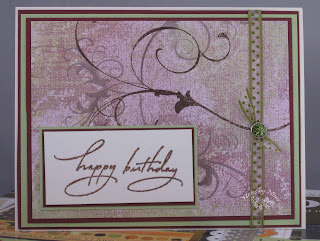 This image does not show the rich and shiny colour of these stickers and they are so easy to work with. 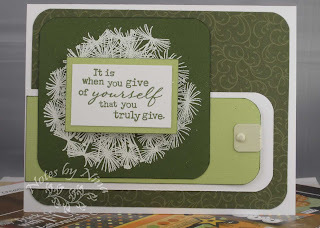 This card was just screaming at me to make it so I did for my sister Barb. What I really wanted to do was show off my new crafting treasures. 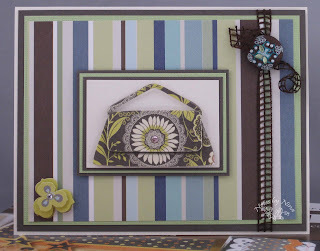 The wonderful Dazzles, the beautiful stitched brad, my new fall designer papers that I could not resist, then of course the fun mesh ribbon that worked perfect to pull the card together. 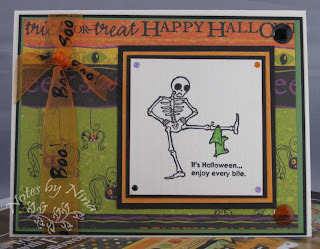 It is Thursday already... Today the card is one of the 5 or 6 Halloween cards I made this past weekend. It was raining and dark yesterday when I set up the light tent, I have been lucky the last couple of months where the natural light has been enough. I guess it is time to bring out the extra lights, this card is a little brighter then in the picture. I tried to adjust it but it thru the actual color off. 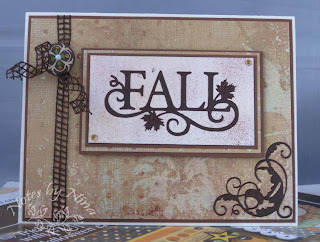 Supplies: Cream, green, orange and black cardstock, Designer paper- Recollections Halloween, Stampin’ Up! – Twick or Tweet, Recollections-Epoxy Stickers, Celebrate It-Halloween ribbon. I managed to make a small army of cards this weekend, all except one are Halloween. I am so behind in schedule, I think this may just be my new schedule because it seems to be the norm as of late. This is a second card from the last Close to My Heart meeting, I think this technique was double stamping. 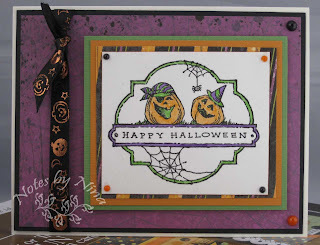 I am going to try to tackle some halloween cards this weekend. This is just a quick little post, it is that time of year again for me where I have no idea where my time goes. 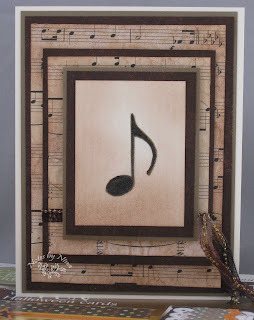 This is a cute little card/tag that I made at the last Close to My Heart gathering I attended. It was suppose to be a demo on mirror image, I guess I failed that technique :) as I did not put my little vellum flower image upside down. 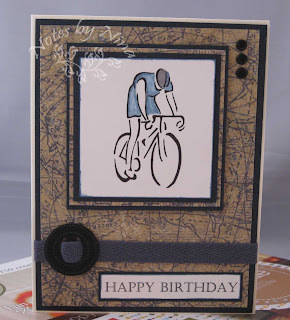 I love the simplicity of this card though.